The textile industry is the world’s oldest branch of manufacturing for consumer goods. Over recent years, however, there has been growing concern about the environmental impacts of textiles. 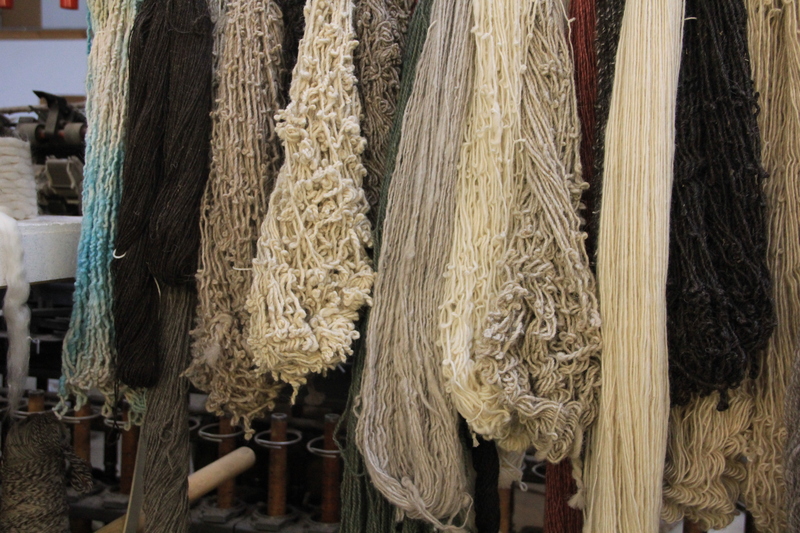 Many traditional natural fibers once used for textiles have been replaced with synthetic materials. Approximately 30-35% of the chemicals in the world go through the textile industry and in the categories of products that cause the greatest environmental impact textiles rank fourth . The modern world needs textiles for a vast assortment of applications, from the carpets beneath our feet, to our clothing, to the household and architectural textiles used everyday. While a hundred years ago the majority of textile production was concentrated in Europe and North America, today, the bulk of textiles and clothing is manufactured in Asia. This shift of the industry, particularly to China and India has all but destroyed the textile business in Europe, the U.S. and Australia. Hundreds and hundreds of textile weaving and spinning mills have closed. Jobs have been lost and towns deserted. 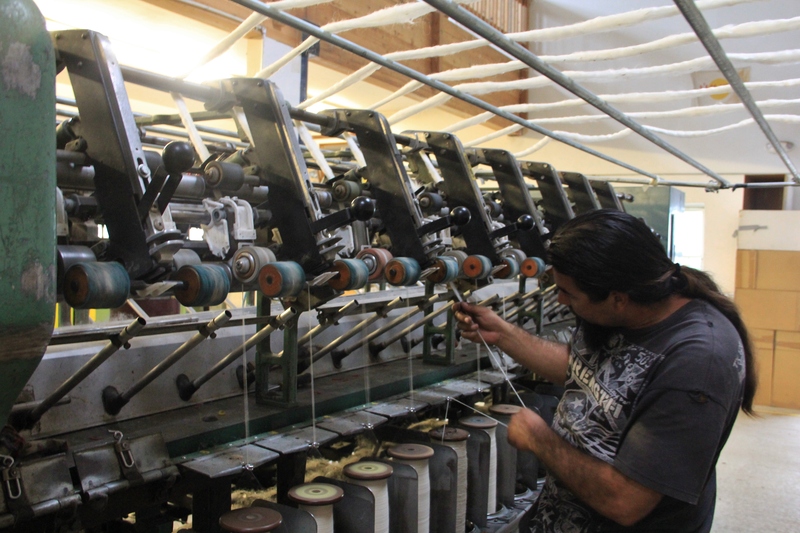 Sheep and livestock ranchers have also been affected as local textile production needs have dropped. As you can see, textiles are heavily intertwined with environmental and social issues. The agricultural industry has shown us that people have sickened of corporate farms and processed foods and increasingly support local farms that provide organic produce. A large proportion of society is also sickened by synthetic materials and hungers for quality natural fiber products. There is a niche to be filled. 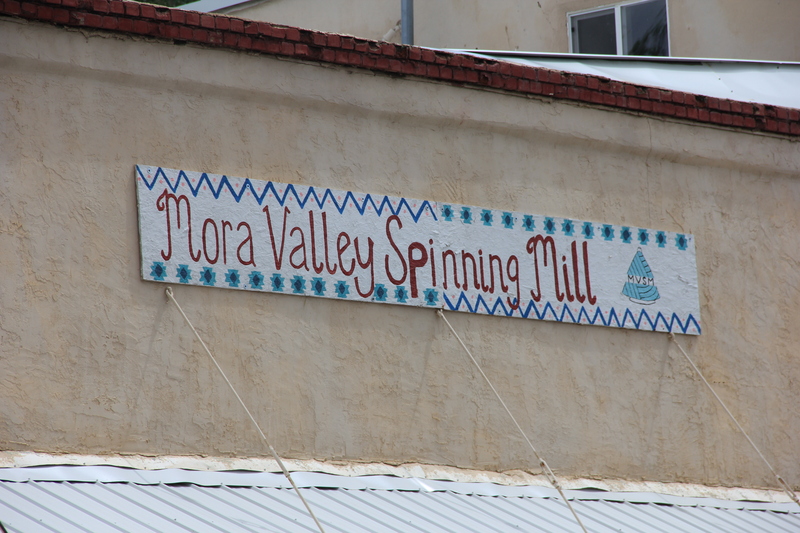 The Mission at the Mora Valley Spinning Mill is to build a sustainable economy around the wool industry in New Mexico and across the nation. Sustainable communities are those that wisely manage resources right in the places where they grow or are found. Through education, through rural communities committed to raising fiber animals and caring for their lands, an important and practical employment—processing fiber, can become an integral component for a sustainable community. At the Mora Valley Spinning Mill the process starts with the raw material laid out on the sorting table. It can be the wool shorn from sheep or fleece from goats, alpaca or any other fiber producing animal. At the sorting table burrs and other large vegetative material is removed by hand and fiber pieces that are too small are discarded. Cleaning. 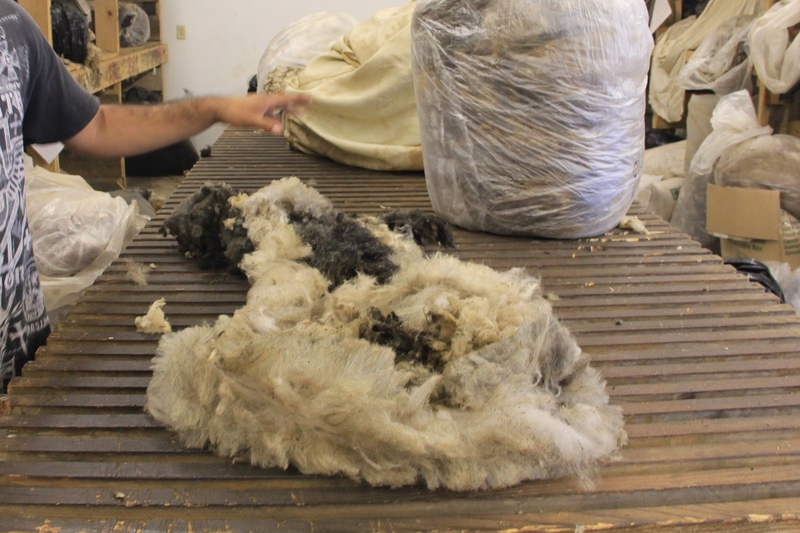 The next step is the picker which rotating at a very slow speed will start to separate the fibers and further remove foreign matter from the fleece. A bag of wool after being run through the picker. Baa, baa black sheep have you any wool? Yes sir, yes sir, three bags full. One for the Master, one for the Dame, one for the little boy who lives in the lane. Washing. Washing the wool is a multi-step process. 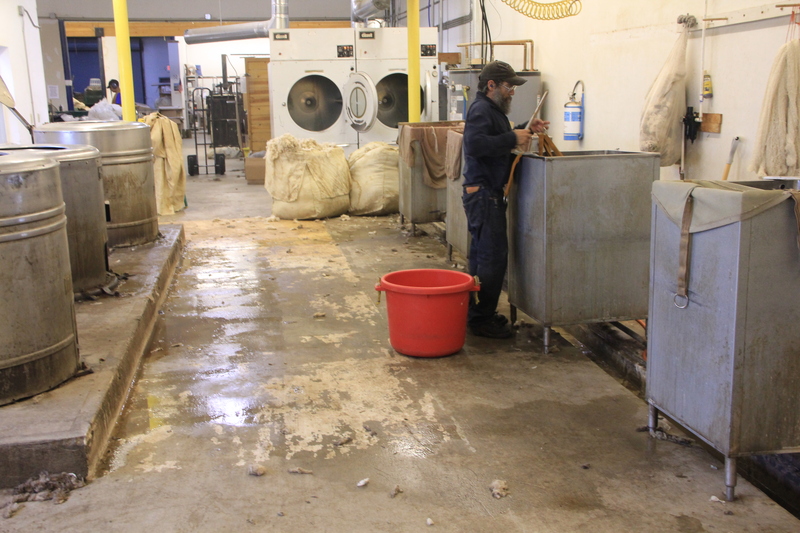 In large tubs of very hot water the wool is washed, then washed again and then again. The lanolin and oils that are dissolved in the wash waters are strained, captured and diverted to a grease trap, keeping the matter out of the sewer waste stream. Drying. 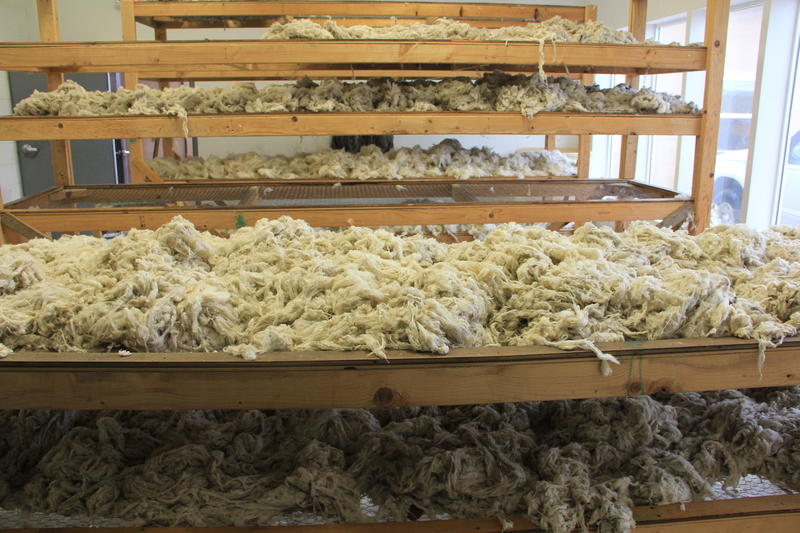 Once the fiber is washed it is spread onto drying racks and left to air dry which usually takes a day or two. The actual drying is not a sophisticated process but to keep things organized each shelf is labeled so that each batch of fiber is thoroughly tracked. Carding. The carder is the largest piece of equipment in the process and is the first part of the operation. It is often referred to as the heart of the spinning mill. The carder takes in clean and randomly disorganized fibers and aligns them in a parallel fashion. 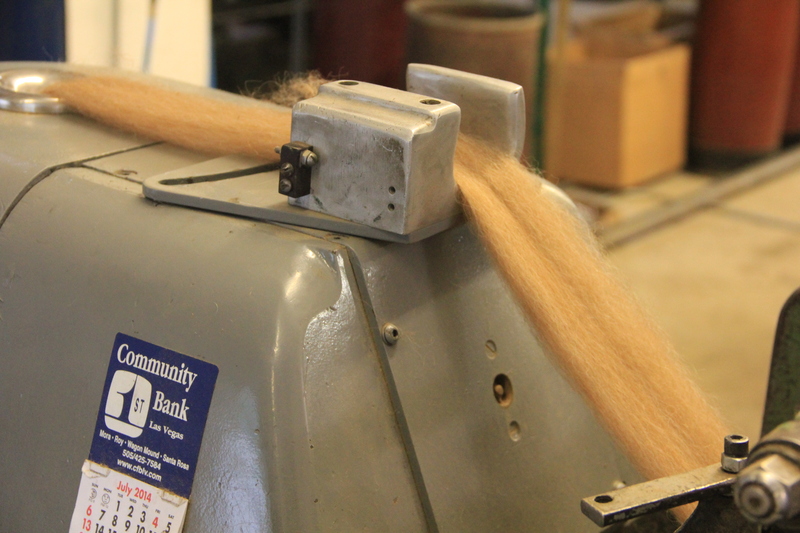 The carder creates a clean even web of fiber that can exit the machine either as a batt as roving or a sliver. 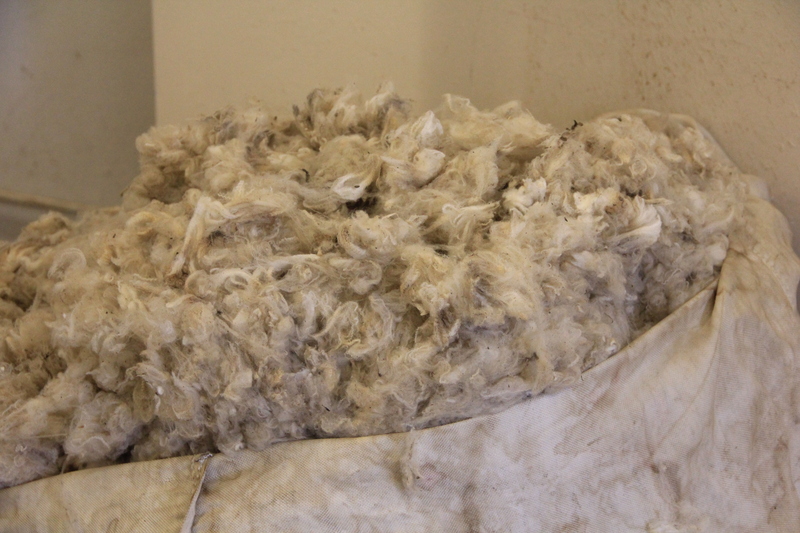 Prior to being laid out on the carding machine the wool is fed into an enclosed box with a high volume of air blown into it. The air separates the fibers into a cloud like mass of fluff. 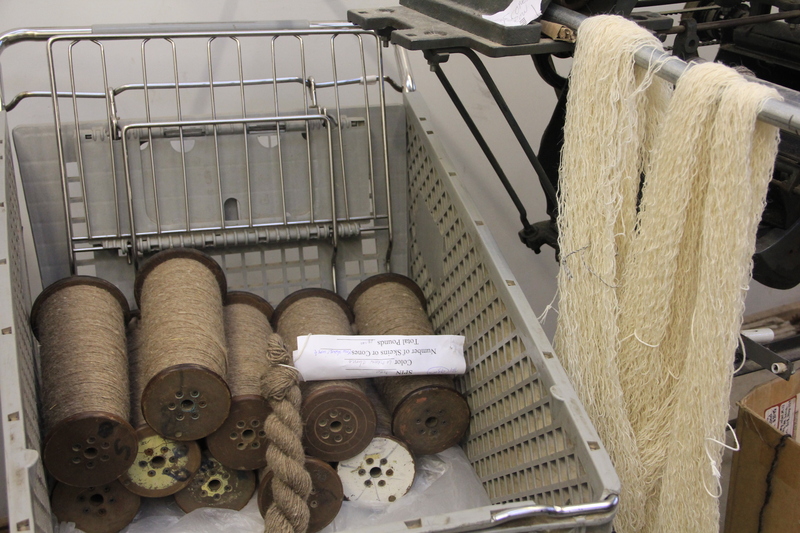 The fluff brought to the carding machine is then laid out in a thin blanket onto rollers that start to feed the wool onto a rotating belt of metal teeth. 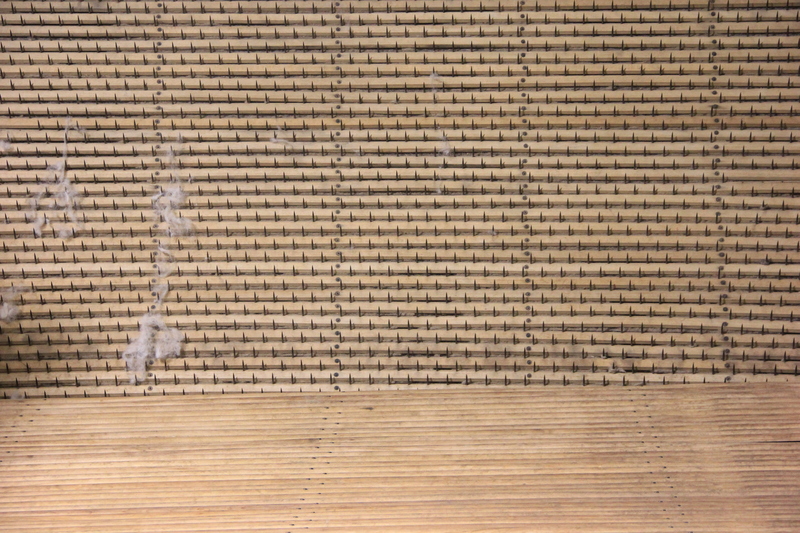 The thin mat is pulled through a series of rollers with ever finer teeth that align the fibers in one direction. 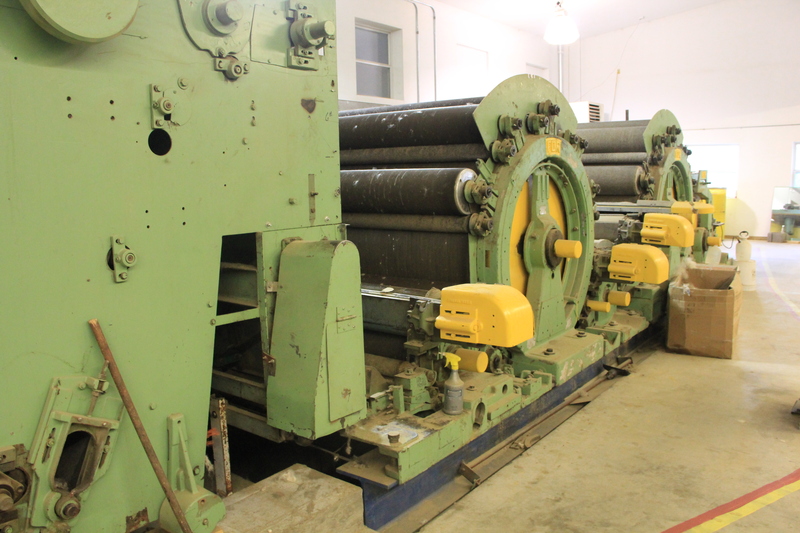 At the tail end of the carding machine the mat is separated into long individual ropes of material that are of equal thickness. 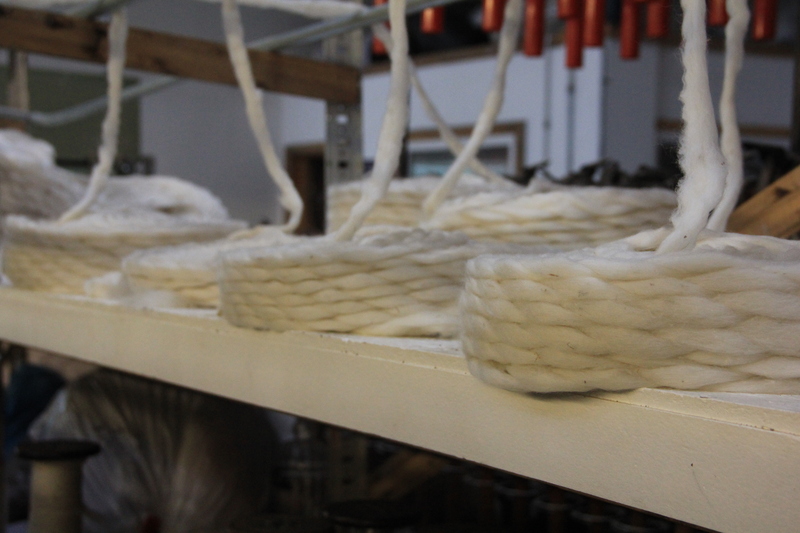 The rope like roving or slivers is collected in large barrels ready for the next step in the manufacturing process. These long lengths of material are held together by the simple cohesion of the aligned fibers. Drawing. The draw frame takes the sliver from the carder and creates a new sliver that is absolutely consistent in size over its entire length. It also further aligns the fibers to be parallel, and makes a stronger sliver for ease of processing. 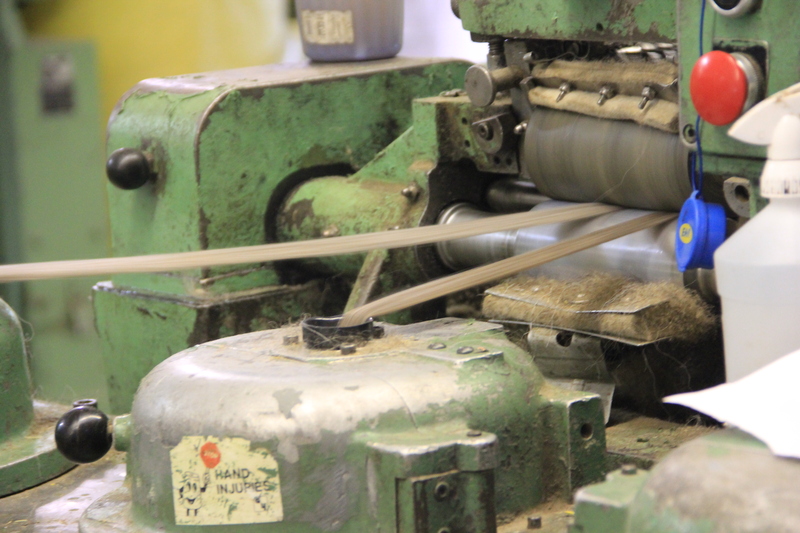 The next machine draws out the sliver to the desired size required for the particular yarn to be spun. 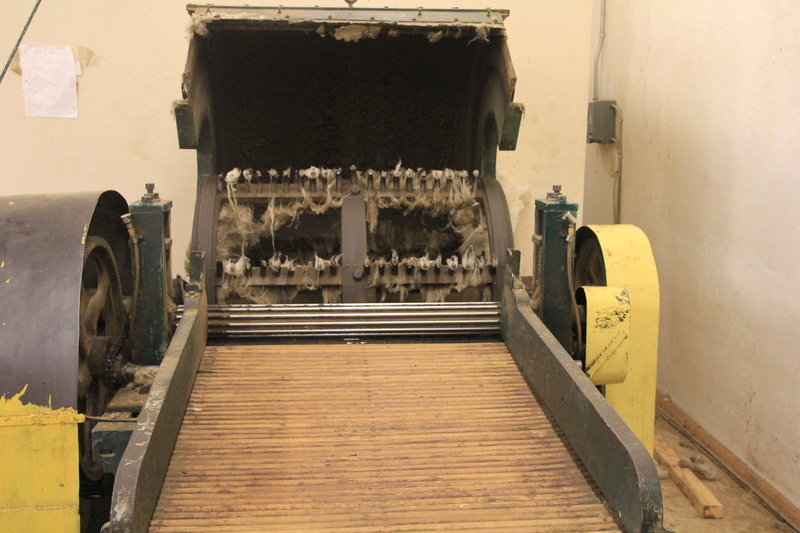 The draw frame accepts several rovings at once and in a brushing action further aligns the fibers. Each pass through the draw frame averages any thick or thin sections of the roving and improves the consistency ready for spinning. Pin drafting is another machine used in aligning the fibers. The sliver is pulled through different sets of metal combs with teeth that range from coarse to fine. 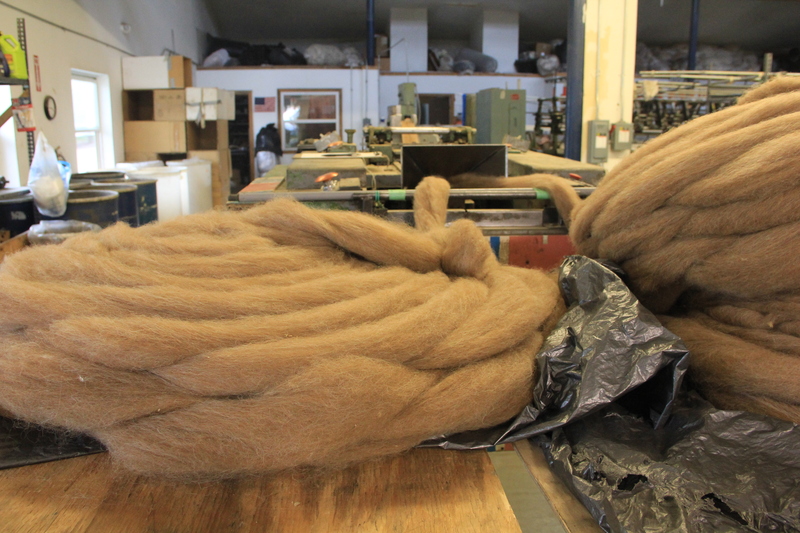 Once the material has been combed and straightened it is ready to be spun into yarn. Spinning. The spinner draws in the prepared slivers and directs them through a measured and controlled process that produces an extremely consistent fiber stream. This fiber stream is then twisted into a finished single ply of yarn and wound on bobbins. Yarn size and twist per inch are easily controlled. 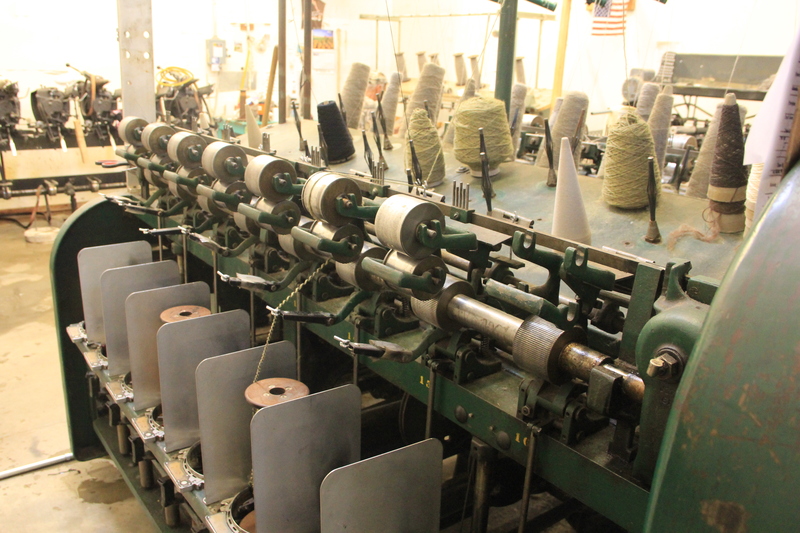 A single ply yarn on the spinner can be produced or a combination of two or more plys to create a thicker yarn. This is a place to create interesting and unusual yarns by combining single plys of different colors to create variations in visual appearance. The most common yarns are 2 and 3 ply. 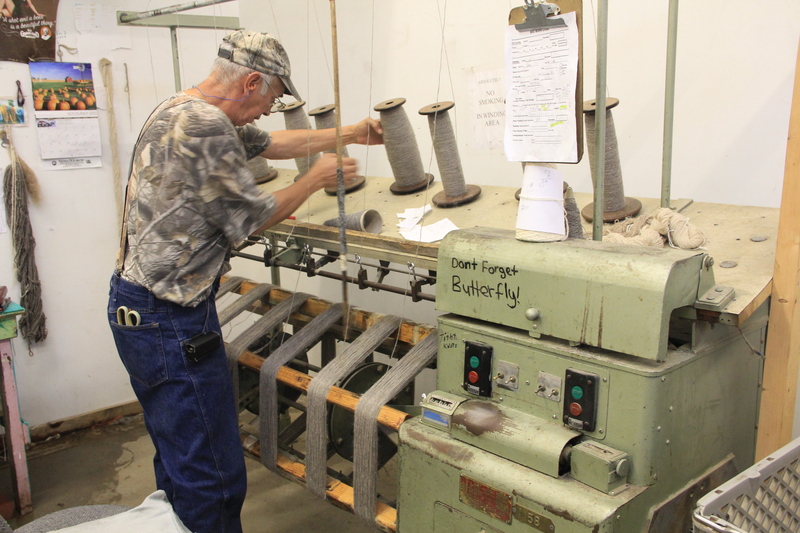 All of the equipment at the Mora Spinning Mill has come from older mill operations that have closed their doors, predominantly from the east coast of the U.S.. Replacement parts for these antique machines are often no longer available but because they are of basic technology and material, parts can be improvised to keep them in service for many years to come. Coning. Yarn passed through the cone winder is metered and wound on cones. The speed at which the cone is built, tension at which the yarn is applied and length of yarn on each cone in yards or meters can be preset. Cones are a standard delivery means of finished yarn. Skeining. 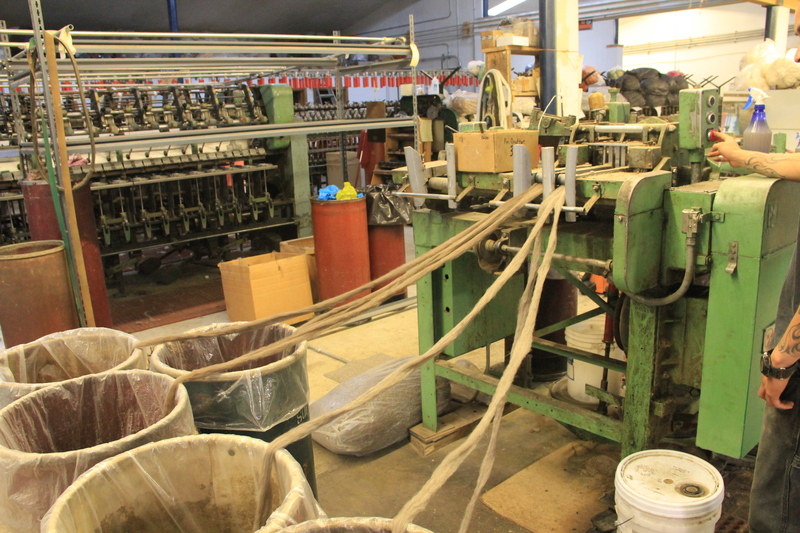 Skeins are a delivery method for yarn that is prepared by using the skein winder. This process meters and winds the yarn into one and one half yard skeins. 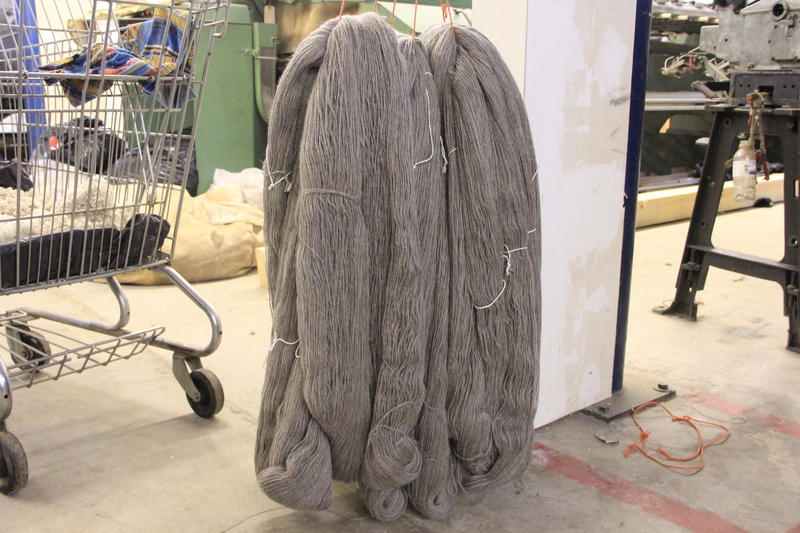 Skeins can be produced by the yard or by approximate weight. Each sheep breed has wool with special properties. These differences should be valued and utilized in processed products. 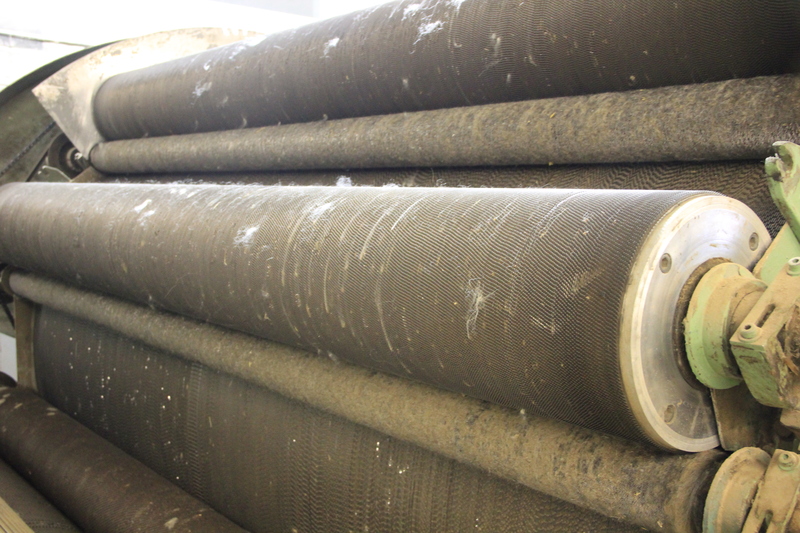 From start to finish each order and shipment of raw fiber is tracked through the entire spinning process. The integrity of batch individuality and source of the fiber can be protected at small operations like the Mora Spinning Mill. Changing the way we think of how to use resources creates opportunities for innovation. 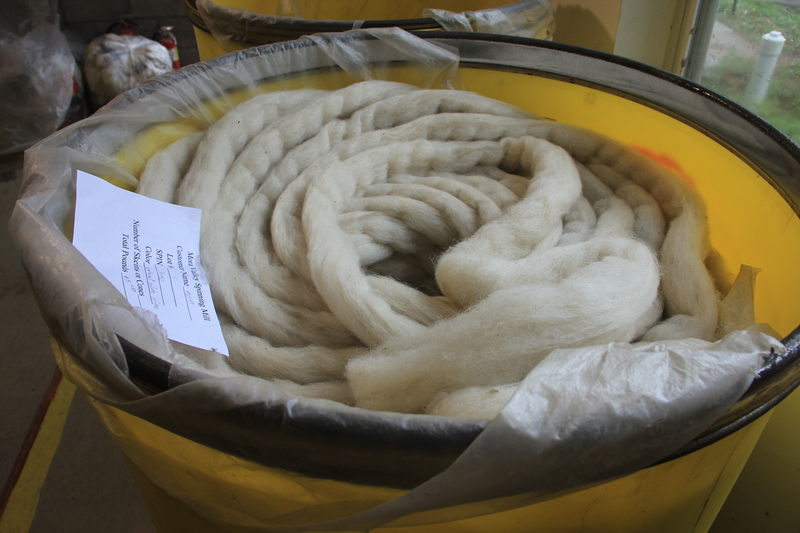 The more awareness of the small-scale, local fiber industry the more people will create products, the more people will sell and trade, the more people will process the raw material, the more people will raise fiber animals. At the Mora Valley Spinning Mill they wash, dehair/deveg, pick/blend, card and spin your fleeces and return your fiber to you. They hope to show people that local processing centers can do what growers and artisans need done with their wool, so that it becomes a desired product for its beauty and usefulness. 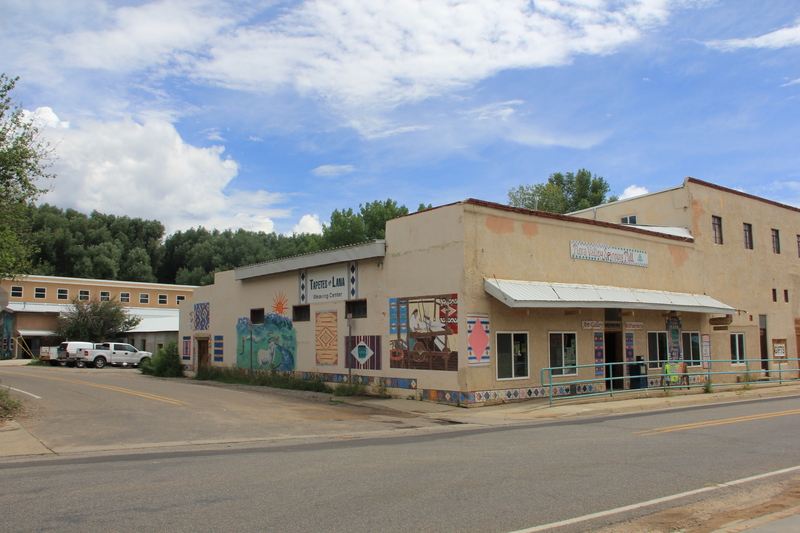 The mill is open to the public for tours and is located on the corner of route 518 in Mora, New Mexico. Mahalo to the folks there for showing me around. In order to build sustainability in our rural communities we need to think how we use local resources and create opportunities for innovation while protecting the animals, the land and the people. This entry was posted in environment, local economy and tagged fauna, New Mexico, preservation, sustainable. Bookmark the permalink. As usual, very interesting and informative, Dohn. We tend to take industries like this for granted without having much of a clue as to what actually goes on in the process between the farmer’s field and the clothes shop, so it’s refreshing to get such an insight. I don’t know if you’re aware of this, but arguments have been raging for years in Britain about the origins of the nursery rhyme Baa Baa Black Sheep. The strongest contender is that it originates in the wool taxes of the 12th and 13th centuries and the impact they had on poor rural communities. One third of the wool produced went to the King (the master), another third went to the church (the Dame) and the remaining third went to the little boy (the farmer). Some versions end with the line: One for the little boy who CRIES down the lane. Others argue that the rhyme has its origins in the slave trade of later centuries, but as there is no solid proof for any of the arguments we can believe whatever we want to. A brilliant and informative piece about the background and specifics. I heard recently that there is just one factory in the UK in Yorkshire which can wash and card the wool from all the Uk’s sheep …or it has to be exported for processing. How mad! 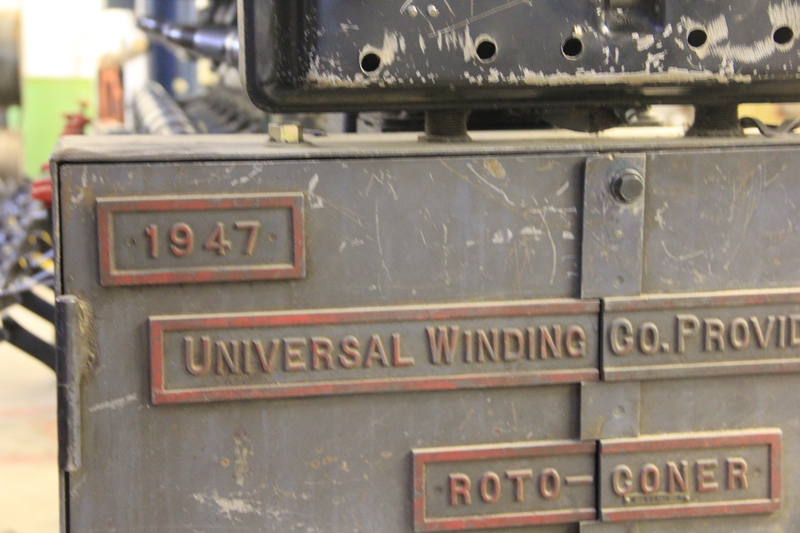 It’s an unfortunate circumstance when local and useful resources that have value and can’t be used more productively Hopefully all of that old milling equipment has not been melted down for scrap and someone will resurrect it in the near future. There is a need and use for natural fibers and could once again contribute to employment and the local economy.Thank you for the insight Julian. The valleys and dales of Cumbria are suffering the same fate you describe. Wool was once the staple harvest. The herds of hill sheep keep the grass short for the thousands of tourists who come to walk the fells but nowadays fleeces cost more to shear than they fetch at market so the whole industry has to be subsidised. The Borders (in between Scotland and England) were home to thousands of small woollen mills, mostly closed down now except for one or two that supply the luxury market. Well done Mora Valley Spinning Mill for turning back the tide. Thank you kindly for your input. Aside from the economic aspect I’m gravelly concerned of the knowledge that is soon to be lost. The knowledge of a craftsman is a finite skill, once passed father to son or mother to daughter. It’s sad to think those skills are in decline but someone, somewhere, sometime, will crave that knowledge and perhaps the internet is the place to create a database of those who want to pas on their skills? You are so right Anna. Fortunately there are folks and organizations recording many of the “old” ways and making the information available on the internet and places like You Tube.On the other hand the general public is unaware of the loss and common shared knowledge is more about using technology. A lovely post on a wonderful example of re-localization and re-skilling: the beating heart of transition town thinking in action. Thanks for sharing! Very interesting. Thanks for the information. I agree that local farming and industry like this is the way to go.